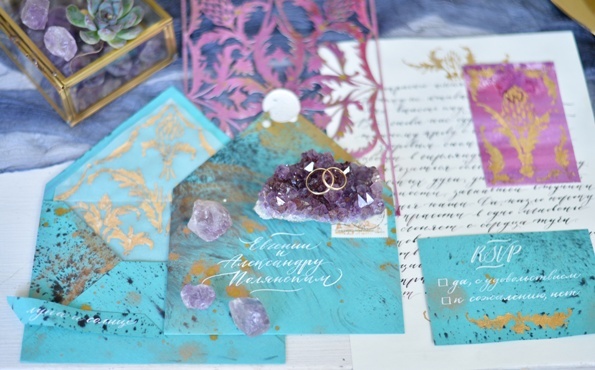 Unless you want to strictly stick to the white/ivory/ecru wedding stationary traditions, opt for something bold and memorable for your wedding invitations! We recommend choosing a deep moody palette with a hint of light (a metallic color or some sparkle would look great together with full jewel tones). Envelope liners are so popular this wedding season! Eye-catching and full of opportunities to personalize your wedding invitations, envelope liners are a great option for you if you want to add a personal touch to your wedding invitations without ruining the overall look of your wedding stationery. Make use of this extra space and show your wedding guests what a creative bride you are! One of the best trends in wedding invitations is the calligraphy touch a lot of brides add to their wedding stationery this year. Opting for a hand-written wedding invitation (or why not just a part of it) is a great way to offer your wedding guests a modern reading of the old-fashioned calligraphy wedding invitations from the past century. Offering an alternative to the traditional romantic watercolor wedding invitations, geometrical shapes can be skillfully incorporated into the design of your wedding invitations with a contemporary feel. You can choose from almost any geometrical shape (triangles, squares, rhombuses, you name it) and give your wedding stationary the bold and unique look you’ve been dreaming about. Let’s admit it – gold (in weddings stationary) is here to stay. It is used in almost any aspect of modern weddings and it would surprise us (and you) if it wasn’t listed as one of the trends in wedding invitations for 2016. You can choose from metallic gold and glitter gold to deep rustic and even antique gold shades to perfectly complement your wedding theme and wow all your wedding guests with your luxuriously gold-decorated wedding invitations.